With eyes open you may see Eade but close them and you’ll hear Julie Andrews. Eade’s stage presence charms throughout the three-hour production.A Judges and People’s Choice winner at this year’s Short and Sweet festival, Sahlani plays his emotions on his sleeve as father, patriot and love-interest while his voice is a nice complement to Eade’s. Congratulations to the winners in our fundraising raffle on behalf of the Motor Neurone Disease Association of NSW & thank you to everyone who purchased tickets to support this worthwhile charity. Special thanks to our Front of House staff & ticket sellers from The Sound of Music! Meg Day’s direction and set design, Clare Moroney’s musical direction, Lauren Nalty’s choreography, Rod Bertram’s evocative lighting and sound, the orchestra’s playing, and John Plaege’s props all combine to make an effective and professional-looking production. Add to that a cast in which there is not one weak link and you can get ready for the heartstrings to be pulled. Congratulations to our winners and thanks to everyone who supported this amazing show! Congratulations to our winners & thanks to everyone who supported our charity fund-raising efforts to help out 9-year old Jai Bruynius-Greene & his family. What can one say about Spamalot, except that it is totally ridiculous, as one would expect from a Monty Python idea. This musical, “lovingly ripped off” from the motion picture Monty Python and the Holy Grail, does great justice to the craziness of the genre, and this production by Bankstown Theatre Company lovingly embraces the whole idea. HUMAN NATURE ANNOUNCED AS OUR PATRONS! ​One of the world’s greatest pop vocal groups and a true international success story, Human Nature, have agreed to be our Patrons, almost 30 years after beginning their performing careers in musicals with us! Friends from an early age, Toby Allen, Phil Burton, and brothers Andrew and Mike Tierney performed together in our 1995 production of West Side Story. 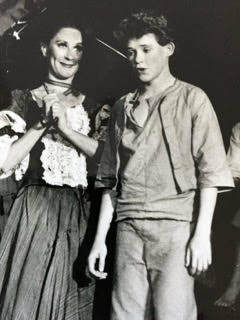 Years earlier, Mike also performed the titular role in Oliver, (pictured right with Sharon Babcock, nee Dermody) which we are presenting again at The Bryan Brown Theatre this July, 25 years later! Toby goes on to say, “community theatre is such a wonderful place to promote confidence in young people, getting the opportunity to work along side others that share a love for the performing arts. It also shows them that when people from all walks of life come together in the community, they can work together to create wondrous pieces of entertainment." Human Nature currently reside in Las Vegas where they perform their headlining hit 'Jukebox' show, 5 nights a week at The Venetian. They also recently undertook a national Australian tour in February as part of their ‘Ultimate Jukebox Tour’ following the success of their #1 album, ‘Gimme Some Lovin’ Jukebox Vol II'. This weeks Bankstown Canterbury Torch Newspaper! ANNIE IS A HUGE HIT! A spectacularly successful opening weekend saw our audiences raving about ANNIE!! "We just LOVED it! ", "Congratulations on a brilliant production BTC!". "Mum, the kids & I had the BEST time!" Only 4 shows to go, you don't want to miss this one! Head over to our home page to book! Looks like critic Paul Nolan loved it as much as our audiences did! THE MYSTERY OF EDWIN DROOD A MASSIVE HIT WITH OUR AUDIENCES! Our recent production of the Broadway smash it "The Mystery of Edwin Drood" was a huge hit with both audiences and critics alike. Superbly directed by the legendary Christopher Hamilton with musical direction by the equally legendary Jayne Hamilton and a star-studded cast, "Drood" once again showcased our ability to provide the highest quality musical theatre productions to our audiences. THE MYSTERY OF EDWIN DROOD is a show-within-a-show unfolding among the company of “London’s Music Hall Royale” in 1895. This musical won the Tony Award for Best Musical and Bankstown Theatre Company’s production makes for a highly entertaining evening. The very talented cast, director and production crew ensures the audience is part of the action and enjoys this music hall melodrama. Charles Dickens’ final, unfinished novel gets a different ending each night in this rollicking music hall style entertainment, a Tony Award winning show-within-a-show musical.Because Dickens didn’t complete his novel, each audience gets to vote for the evening’s murderer, detective, and pairing of lovers. It’s a delightful twist on the musical theatre form. STAGE WHISPERS caught up with 'The Mystery of Edwin Drood' director Chris Hamilton about the challenges of bringing a "musical whodunnit" to the stage.